Happy St. Patrick’s Day Weekend (almost)! It’s also happy “cabbage is on sale big time” weekend and that makes me a happy camper. I’ve been gluten-free for almost 10 years, long before you could pop in to your local grocery store and grab some brown rice noodles. So back in the day, I had to be really creative and came up with several alternatives for “noodles,” one of which was cabbage noodles. 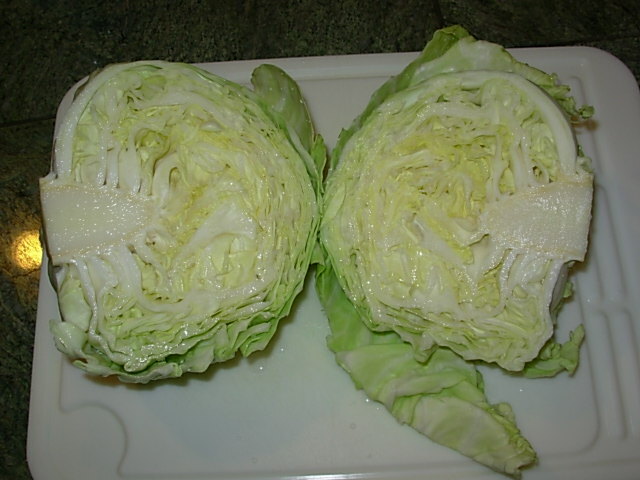 With all the great products on the market, I haven’t made these in awhile, but with two organic cabbages on sale for a buck, and me wanting to drop a few pounds before summer, now seemed like a perfect time to revisit this idea. It’s really simple to make cabbage noodles and they freeze well, so make a whole bunch now while the price is right. 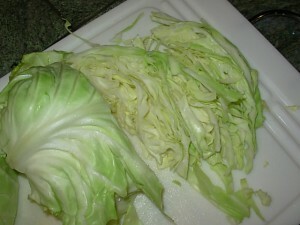 First, wash your cabbage well and remove any brown or wilted leaves. Cut in half. 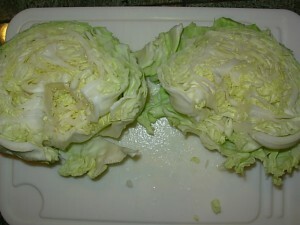 Lay cabbage middle side down and start making long, thin “noodle width” slices, starting from the top. Fill a shallow pan so it’s covered ½” deep with water. Place “noodles” in the pan and cover. Turn the heat on high until water starts to steam. Turn heat down to low and simmer until “noodles’ reach your desired consistency. 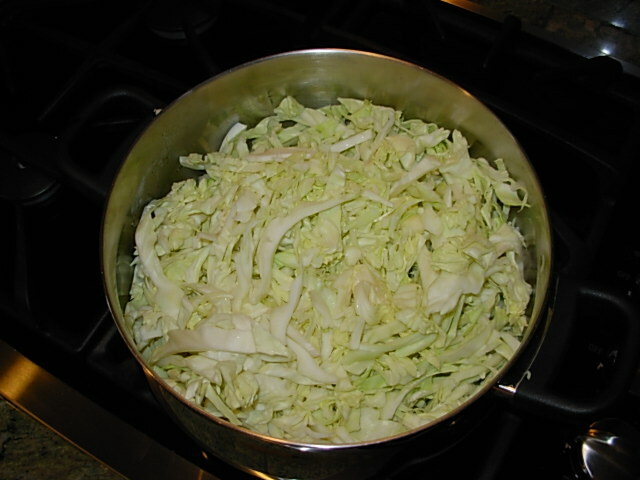 Usually I prefer my veggies raw or lightly steamed, but in this case, I cook the cabbage about an hour until it’s very soft and has more of a noodle taste and feel. 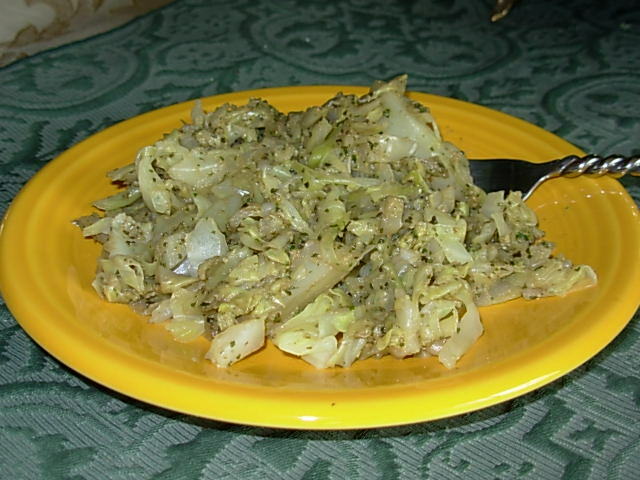 Top cabbage noodles with your favorite sauce; they’re pictured at the top of the page with some of my Fresh Vegan Pesto for a lovely green and festive St. Patty’s Day dish. This entry was posted in Recipes, side dishes and tagged basil, cabbage, gluten-free, health, healthy, italian recipes, noodles, pesto, st. patrick's day, vegan, vegan cooking, vegan recipes. Bookmark the permalink. Thanks Jacqui! Love to hear how they turn out for you. I’ve never thought of treating cabbage this way either! Great idea, I’m always wanting to eat more cabbage because I know it’s healthy but am often stumped as to what to do with it to make it more appetizing or interesting. Thanks Lee! Hope you enjoy the idea.